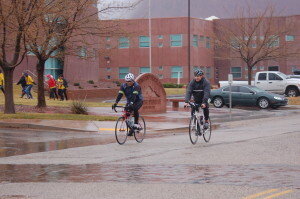 ST. GEORGE – Rain, cold, wind and more rain marked the third annual Road Rage Duathlon, held Saturday morning at Lava Ridge Intermediate School in St. George, with temperatures sitting in the low 40s at the 9 a.m. race start and a steady rainfall drenching racers and spectators alike. 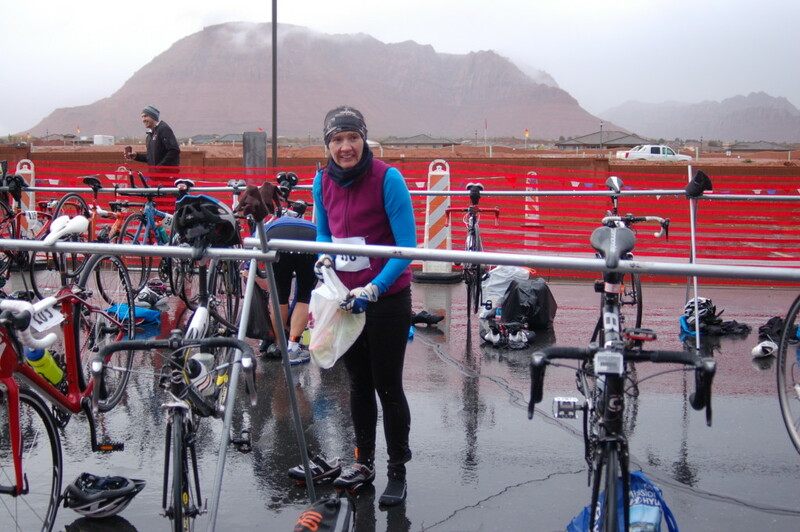 Before the start, racers and supporters could be seen huddling together under eaves, tents and any dry place, but it was to no avail once the announcer called everyone to the start and the countdown began, signaling the beginning of a cold, wet morning. 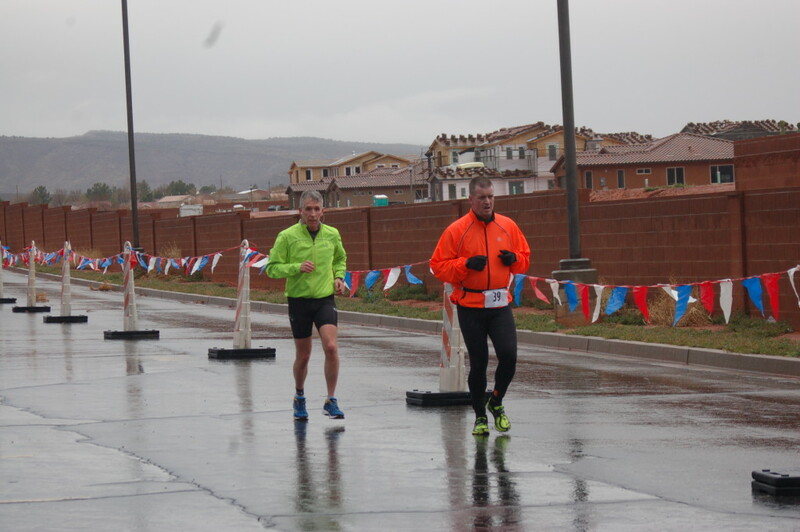 Part of the St. George Races slate of events for 2015, the duathlon featured a run-bike-run course in two different distances: sprint and Olympic. 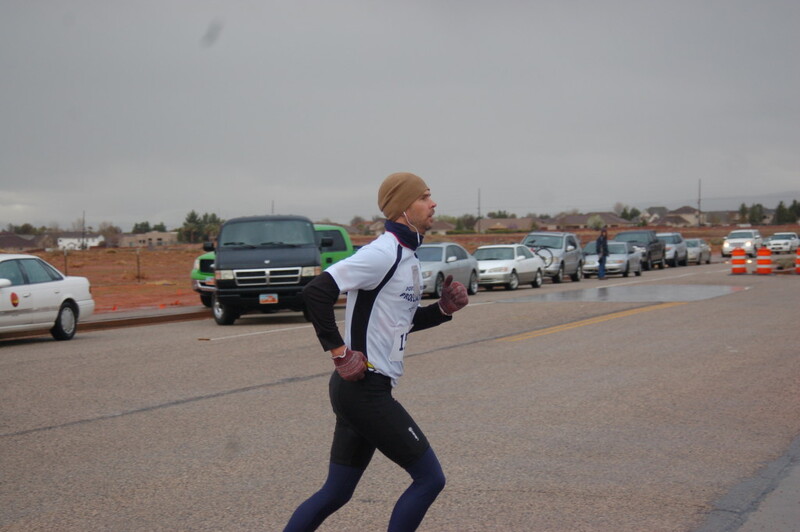 The sprint distance consisted of a 1.5-mile run, 10-mile bike and-1.5 mile run. 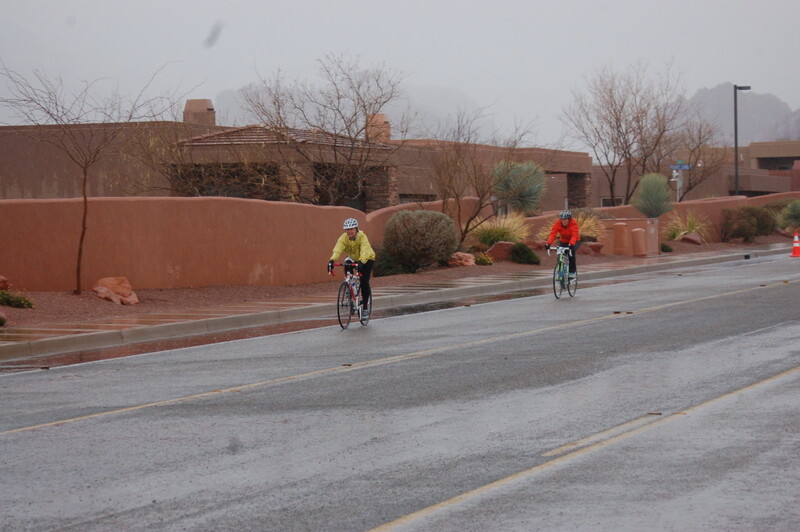 The Olympic distance was supposed to be doubled, but the bike course was cut short due to the wet conditions, and the Olympic distance bikers ended up riding the same 10-mile loop as the sprint distance participants. Defying the weather, a handful of competitors toughed out the day, despite not being able to feel their legs because of the cold. 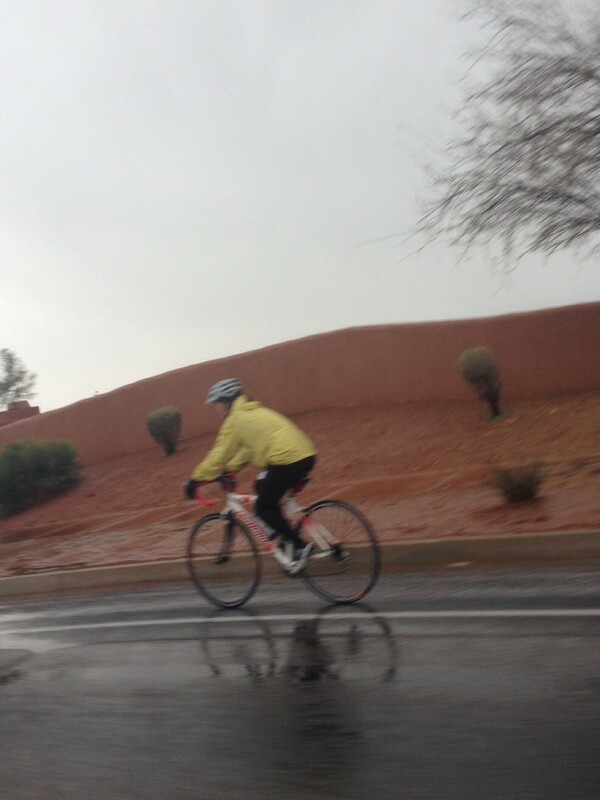 Jody Richards, of St. George, said he came out because of his wife. 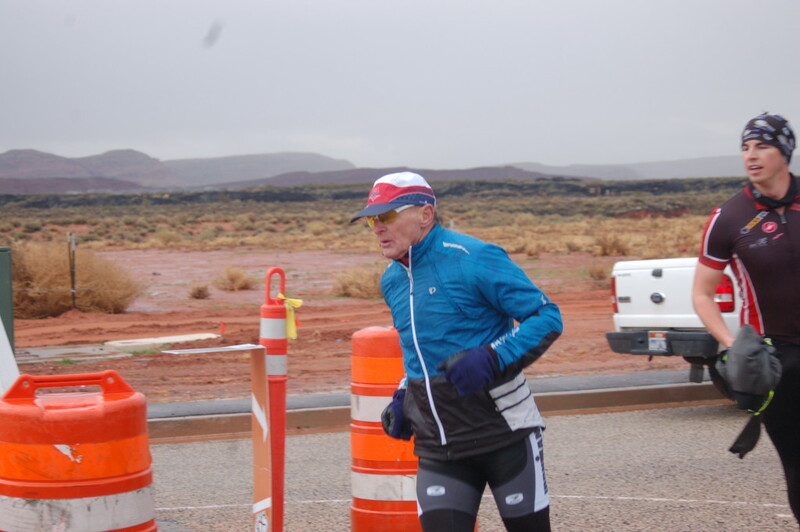 “I am a great supporter of hers,” Richards said. 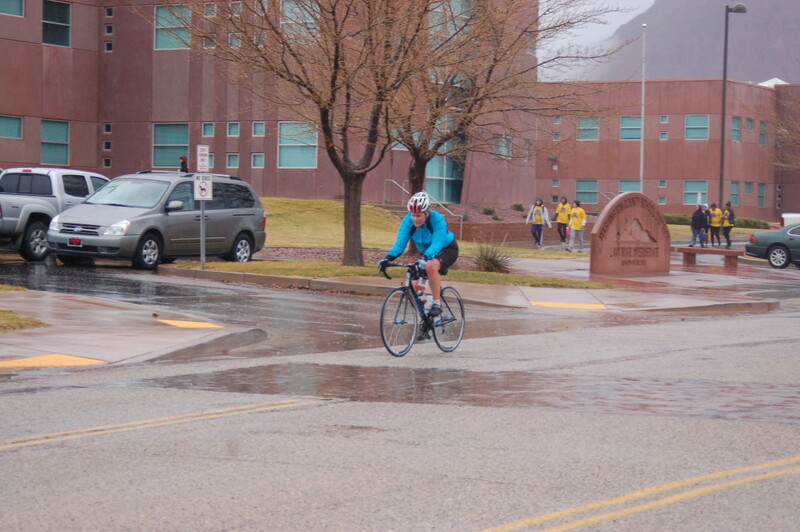 On Saturday, he took his support to the next level, participating in the sprint distance portion of the duathlon. 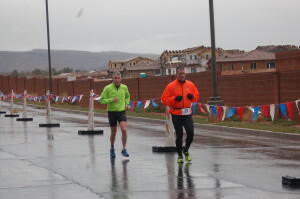 A relatively new race on the St. George Races circuit – this was the third running – the Road Rage Duathlon is steadily growing in participation numbers and continues improving. 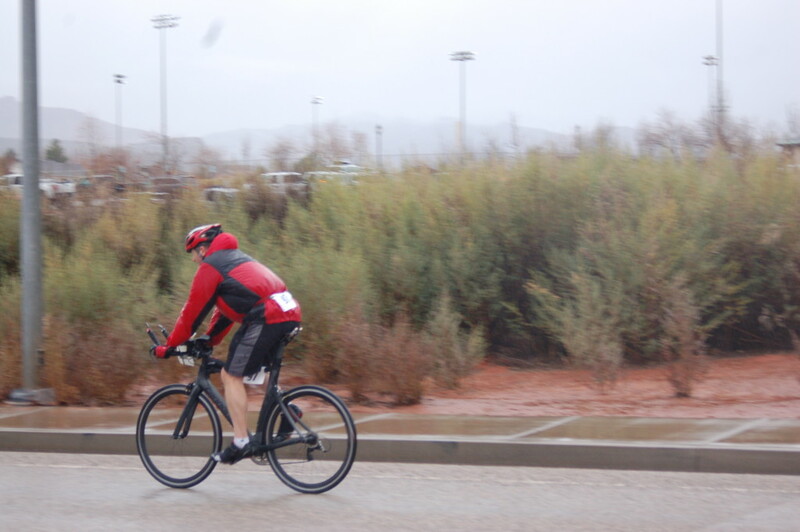 This year’s event featured a new bike course that contained only right-hand turns, which made the course safer for bikers and less impactful on traffic, race specialist Anilee Bundy said in a previous interview. 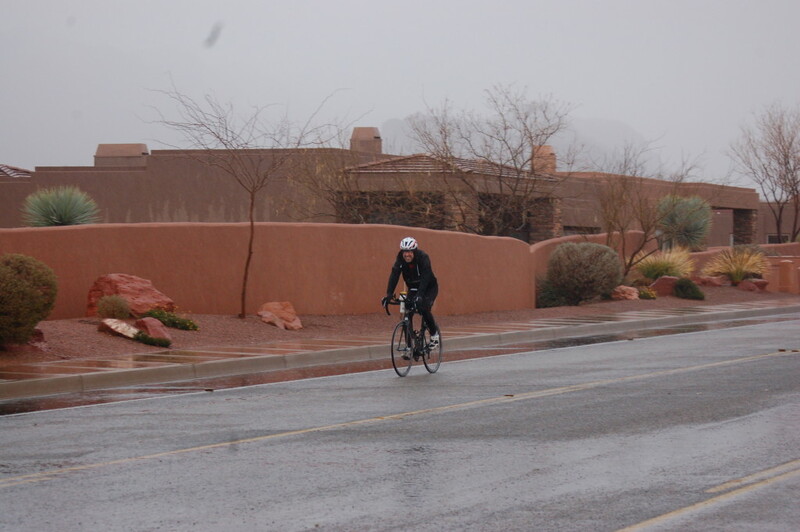 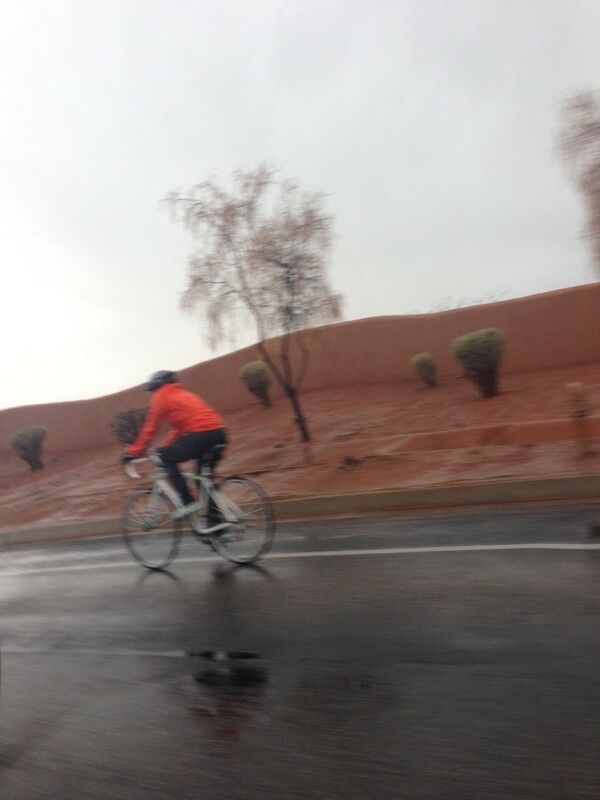 Riders mostly hugged the road shoulders on the bike course, though some roads, such as Snow Canyon Parkway and Sunset Boulevard, had one lane closed for the riders. 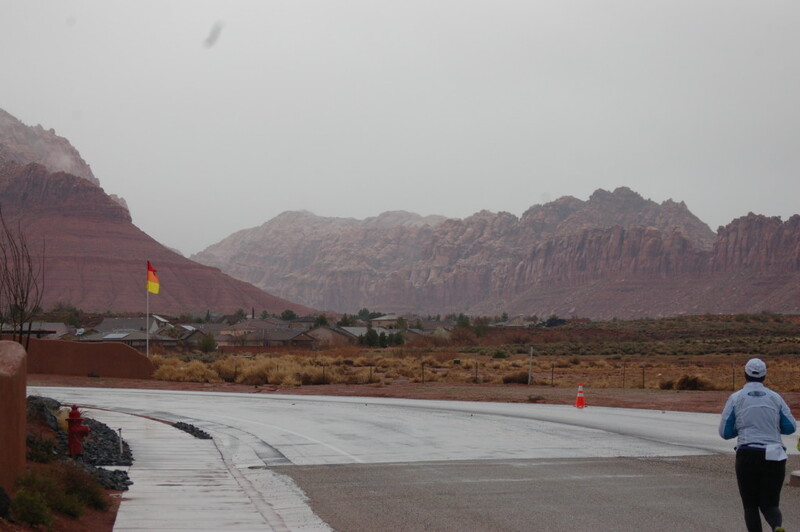 A small section of road near Lava Ridge Intermediate was also closed. 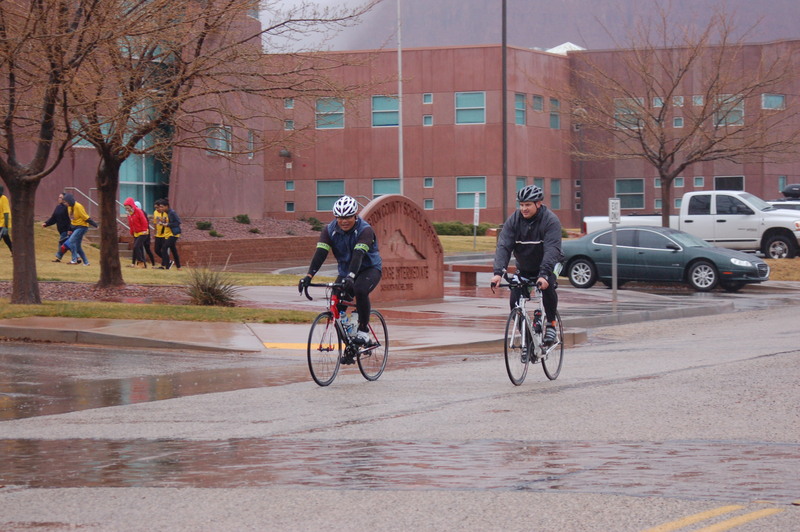 After the bike course, racers took to the streets one more time to complete the final running leg of the duathlon and were greeted at the finish by medals and race refreshments. 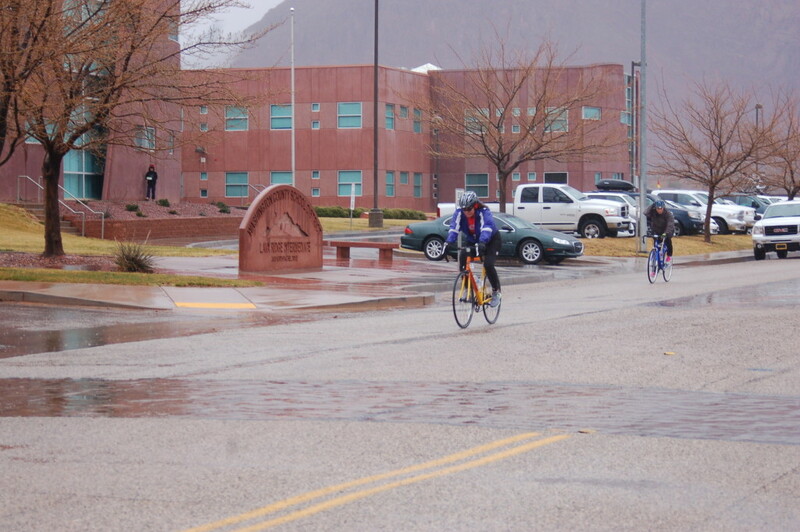 Makeshift garbage bag ponchos were also handed out to help the contestants get warm.